Need something to do with your ample spare time? Consider the Degree Confluence Project, http://www.confluence.org/index.php. 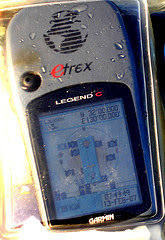 Similar to geocaching, this site encourages people to visit the intersections of latitude and longitude lines (which they call, somewhat inaccurately I think, confluences). This frivolous-seeming idea actually turns out to be kind of interesting when photos and information from “confluences” around the world are accumulated in one place. Rather than certain famous sights which most of us are already familiar with, the photos are of random places in the countryside. Thus, a snapshot of the character of land and vegetation cover becomes viewable for places all over the Earth; not a bad thing for the geography freaks out there. 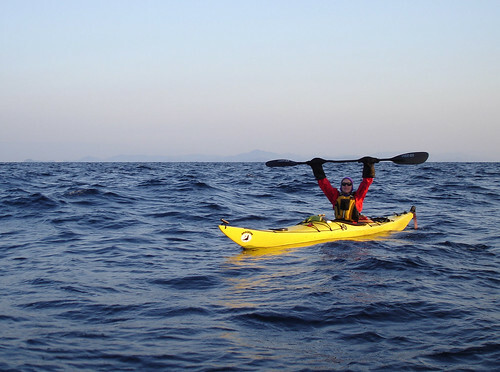 In Japan, all the land-based confluences have already been recorded (although the site accepts repeat visits), but most of the ones that lay in the sea within sight of land have not (get'em, kayakers!). 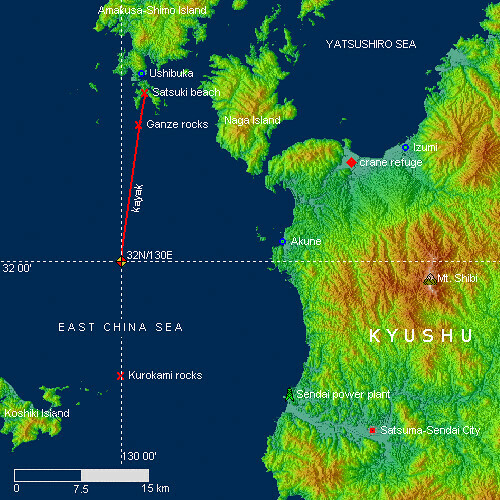 Such was the case with the confluence nearest our home, namely 32N 130E, about 20 km south of Ushibuka off the southern extremity of Amakusa. We had skirted this point within 290m when returning from a weekend circumnavigation of Kami-Koshiki Island last summer, but alas it did not occur to us to visit the point then. So we set out in the wee hours of Feb. 13 to rectify this oversight. We reached the point in less than 5 hours of paddling, at sunrise, took the required pictures, then returned to our departure point. On the way we enjoyed a beautiful winter starry sky, shooting stars, a rising crescent moon, and a brisk southerly breeze that provided waves to ride on the way back. Reaching the rock shoals of the Amakusa’s south coast, we were surprised at the transparency of the sea: the bottom could be made out at up to 15m depth. The lack of plankton due to the relative cold of the winter and the absence of significant rain (and hence river runoff) are the likely causes of the phenomenon. Leanne celebrating upon arrrival. 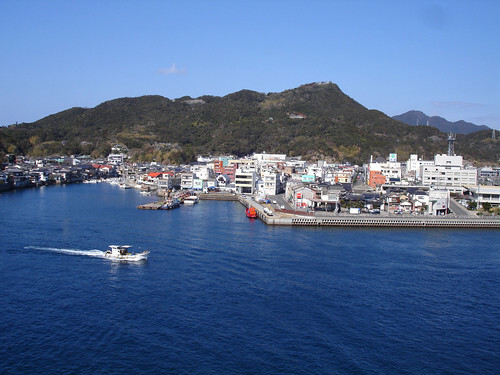 Amakusa is visible in the distance. 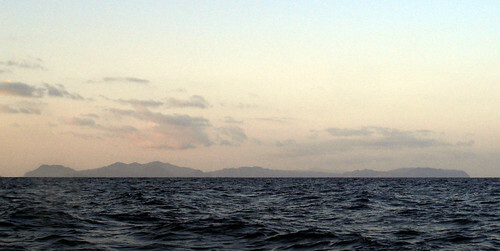 Looking southwest from 32N 130E at Kami-Koshiki Island. Recently our visit to 32N 130E was posted on the Degree Confluence Project website. For additional pictures and a detailed writeup of our trip check it out here. On Thursday we went kayaking in Ushibuka from Mogushi beach south to Kata Island, a round trip of approximately 20kms. Kata Island is a small uninhabited island with wild looking sea cliffs plunging into the sea on the west side. Recently we read in the newspaper that wild boars have been seen swimming from this island to outlying rocks to feed off the bait left behind by people fishing. Unfortunately while we were there we didn't catch a glimpse of any of these adventurous wild boars. 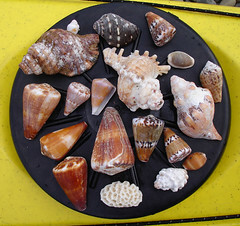 However, I did find this eye catching collection of seashells on a small beach on the north side of the island.